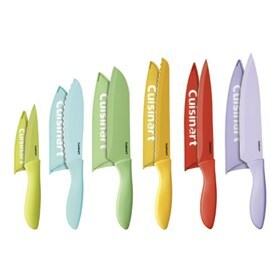 The Cuisinart C55-12PCER1 is a set of 12 pieces of knives. This professional-quality stainless steel knives have a cutting-edge, non-stick coating that makes slicing easier and allows coding during food prep to avoid cross-contamination. In style-conscious hues for today's design-smart consumer, these premium knives come with matching blade guards and ergonomic handles. The Cuisinart 12 Pcs. 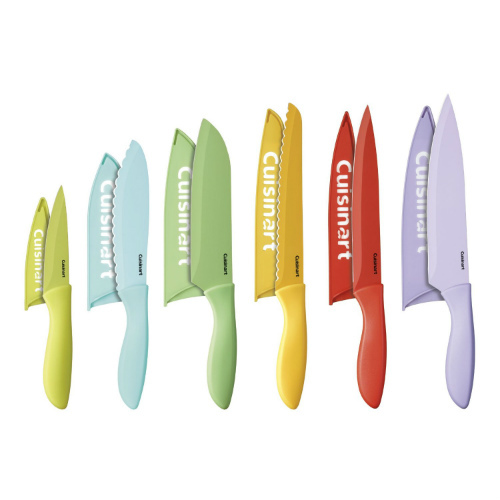 Ceramic Coated Color Knife Set has many exciting features for users of all types. You can extend the lifetime of your Cuisinart 12 Pcs. Ceramic Coated Color Knife Set with the purchase of a FactoryOutletStore Factory Protection Plan. See the Cuisinart 12 Pcs. Ceramic Coated Color Knife Set product video and gallery images above for more details. The Cuisinart 12 Pcs. Ceramic Coated Color Knife Set is sold as a Brand New Unopened Item.